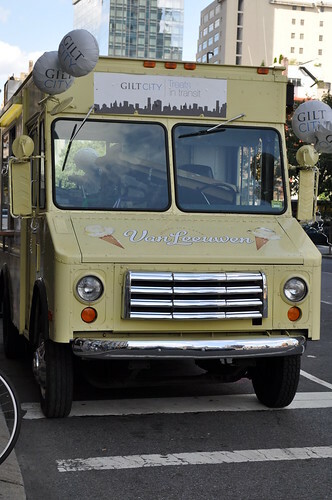 I made a stop at the Van Leeuwen Artisan Ice Cream (VLAIC) truck today because Gilt City had a promotion today that involved free scoop of any VLAIC ice cream. 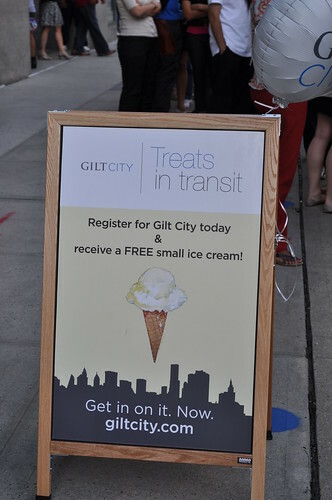 The promotion involved signing up for Gilt City and Gilt Groupe, both of which I'm already member, and receiving a FREE small ice cream. 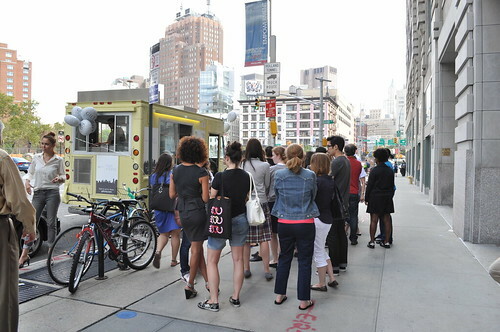 So if there's free ice cream involved, expect a line! These are the flavors that are offered daily. 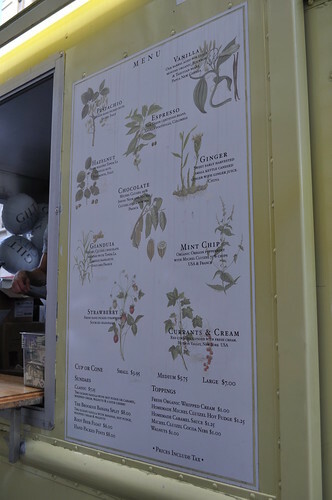 They had four other flavors that were not on the regular menu: cinnamon, Earl Grey tea, cherry chip (a new flavor), and palm sugar (another new flavor). I decided to go with the Earl Grey tea flavor for two reasons: (1) Earl Grey is my favorite kind of tea and (2) it was different than the usual offerings. Nevertheless, you can never go wrong with ice cream on a hot summer day! 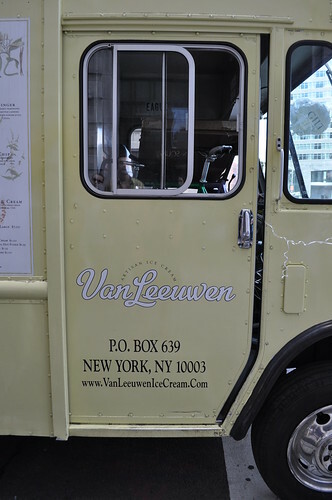 A shot of the front of the VLAIC truck--I love the colors because it gives it that retro, yet sophisticated feel to it. Findings: To be honest, it was a little disappointing. From all the hype I've heard about VLAIC, I thought I'd be an addict immediately. The Earl Grey flavor was certainly creative, I just wish it was stronger in flavor. 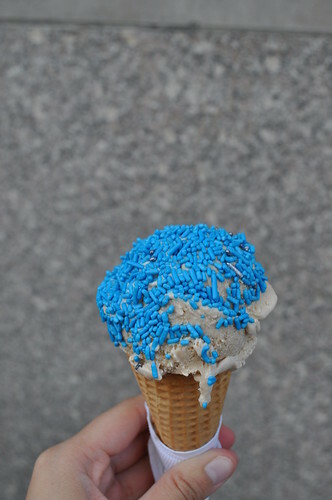 The blue sprinkles made it slightly better. I guess I would have to make another trip and try another flavor to see if this holds true for the other flavors. It is a little expensive for mediocre artisanal ice cream. Artisanal usually implies organic and handmade (and in turn, more $), which I'm definitely willing to pay more for, but when it's mediocre, I'll have to think twice. Then again, when the ice cream is free, I can't really complain! Price point: free today, but usually $3.95 for a small cone.